Kaila took her YHot 200-Hour Teacher Training with Kristin Campbell and Coco Finaldi of The YYoga Teachers College in Vancouver. A transformative journey involving the study of physical, mental and spiritual alignment. Shortly after completing her 70hr Power Vinyasa training in 2013 with Kristin Campbell owner and director of Tapasya Yoga, and more recently studied under Noah Maze in LA to complete the YOGAMAZE Vinyasa 50hr Teacher Tune up. Kaila enjoys teaching alignment based hot yoga because of the accessibility it has to so many. Her Vinyasa and core classes involve strength, cardio and balance conditioning. She invites you to come to your mat for a refreshing practise. Stacey Lockhart (Arseneau) has been practicing Yoga since 2003 and solely teaching since 2009 holding experienced designation. She currently teaches in Nelson BC, since relocating from Vancouver. Stacey has studied with Chris Richardson, Christine Clancy and Tracy Groshak in the Ashtanga and Vijnana traditions, completing additional trainings and mentorships in Vancouver. Along with Yoga, she teaches The Tensegrity Repair Series: a series of movements designed to bring balance and ease to the body’s kinetic trains. Stacey’s approach to teaching is informative, anatomical and non-dogmatic. She carries a thorough understanding of biomechanics, tailoring the practice to each student’s individual needs. Students will find her refined approach both challenging and fruitful. Trisha has been teaching yoga since 2005. Within Canada, San Francisco and India she has studied a wide range of yoga methods - from Bikram to Iyengar, Viniyoga to Anusara. She has deep respect for all these teachings and the process of exploration required to find one's own practice. Trisha' s classes emphasize breath awareness, bio mechanic alignment and connection with one's truest self. She invites students to approach each practice as an adventure into the unknown. 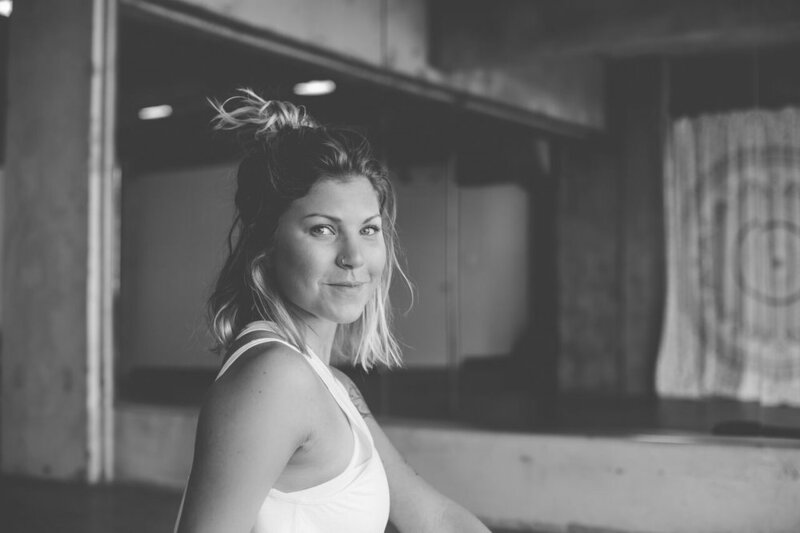 Justine’s interest in a holistic lifestyle and seeing the body as a living, changing organism led her to be inspired and moved by the practice of yoga. Justine fell in love with the organic movement, connecting breath and self awareness in the yoga practice. These fundamental aspects of yoga continue to bring her to the mat to seek connection with the self. Justine completed her 70 hour Tapasya Hot Training with Kristin Campbell at Bambu Hot Yoga in 2015. Justine then deepened her practice by traveling to the Baja in Mexico to complete her 200-Hour Yoga Teacher Training with Christopher Perkins and Nicolina Sandstedt at Yandara Yoga Institute. Justine teaches students to connect with themselves and discover what rests within. Amanda Bell-Tardif, or ABT as many call her, is a purveyor of all things movement. At a very young age she found an intimate relationship with movement and expression through dance. It wasn't until her teens that she discovered the practice of yoga and meditation, upon her first class she found solace and a quality of peace that was both profound and intriguing. With over 800hrs of technical yoga training, 22 years of dance training, and a diploma in Personal Fitness Training under her belt, her approach to teaching is holistic, integrated, and precise. Now located in Nelson, BC, Amanda is excited to share her passion of yoga with the Nelson community as she pursues her studies in Traditional Chinese Medicine. For the past eight years I have been immersed teaching yoga in Vancouver and am thrilled to call breathtaking Nelson BC my new home! I love a spicy, intelligently-sequenced practice, and I’ve refined my knowledge teaching thousands (literally) of Power, Hot, and Vinyasa Flow classes at YYoga in Vancouver. Teaching from a playful, heart-centered perspective, I inspire my students to move from a place of loving empowerment. In every single movement and every single breath is a chance to create more exquisite space and live more fully. Through drawing inwards we can tap into our highest source, shine more brightly, and inspire others to rise. Expansion is contagious! I teach a playful, powerful class with ever-changing choreography and challenge. Yoga practice is an evolution and I encourage my students to step into their light while enjoying the beauty along the way. Inspirations: Authenticity, wisdom, laughter, love, passion, creation, rainy mornings, starry skies, Chilean literature, social action, intelligent speculation, philosophy, farmer's markets and biodiversity, intuition and destined coalescences, the duplicity of light and the abundance of space and time, dance, music, flight, bioluminescent beings and creatures that can thrive anywhere, calmness in the face of tumult, kindness, compassion for all beings, my beautiful daughter Emma Rose, my love Shamus, my mom.